What Do Little Girls Really Learn from “Career” Barbies? Like a lot of moms, I faced the Barbie dilemma when my daughter was younger. Ultimately I figured a little bit of Barbie would sate her appetite (and stop the nagging) without doing too much harm. Like a vaccination, or homeopathic inoculation against the Big Bad. I told myself my daughter didn’t use her dolls for fashion play anyway: her Barbie “funeral,” for instance, was a tour de force of childhood imagination. I told myself I only got her “good” Barbies: ethnic Barbies, Wonder Woman Barbie, Cleopatra Barbie. Now that she’s 10 and long ago gave the dolls away (or “mummified” them and buried them in the back yard in a “time capsule”), I can’t say whether they’ll have any latent impact on her body image or self-perception. It would seem ludicrous, at any rate, to try to pinpoint the impact of one toy. The third, “control” doll was a Mrs. Potato Head, who, although she comes with fashion accessories such as a purse and shoes, doesn’t have Barbie’s sexualized (and totally unrealistic) curves. Girls who played with Barbie thought they could do fewer jobs than boys could do. But girls who played with Mrs. Potato Head reported nearly the same number of possible careers for themselves and for boys. 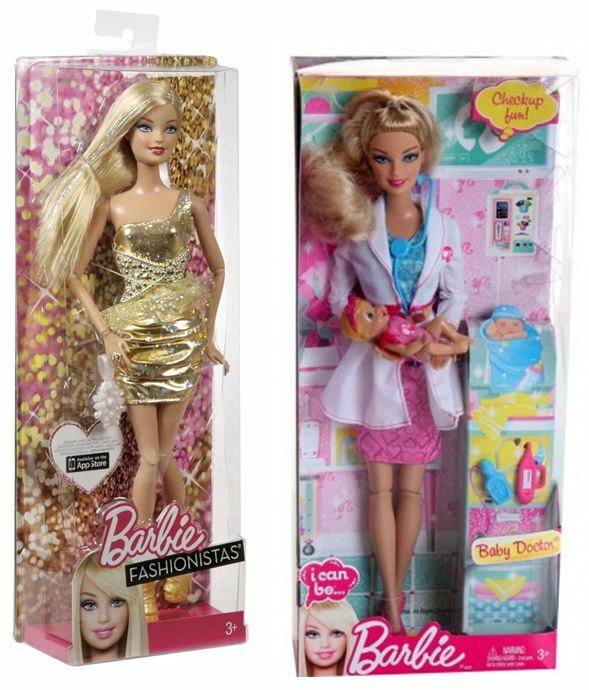 There was no difference in results between girls who played with a Barbie wearing a dress and the career-focused, doctor version of the doll. Obviously, the study is not definitive. Obviously, one doll isn’t going to make the critical difference in a young woman’s life blah blah blah. Still, it’s interesting that it doesn’t matter whether the girls played with fashion Barbie or doctor Barbie, the doll had the same effect and in only a few minutes. That reminded me of a study in which college women enrolled in an advanced calculus class were asked to watch a series of four, 30-second TV commercials. The first group watched four netural ads. The second group watched two neutral ads and two depicting stereotypes about women (a girl enraptured by acne medicine; a woman drooling over a brownie mix). Afterward they completed a survey and—bing!—the group who’d seen the stereo- typed ads expressed less interest in math- and science-related careers than classmates who had watched only the neutral ones. Let me repeat: the effect was demonstrable after watching two ads. Peggy Orenstein is the author of four books, including The New York Times best-seller Cinderella Ate My Daughter: Dispatches from the Front Lines of the New Girlie-Girl Culture. You can follow her at her blog, where this post originally appeared, on facebook, and on twitter. Sociology is harder work than this. I ultimately conclude focusing on dolls, TV commercials and the like is trivial stuff in comparison to the real social grist in life--years spent engaging daily with friends, family, other significant adults, teachers and authority figures. What takes many incredible women with tremendous potential out of the mainstream workforce and leadership, in my opinion, is the fact that they have the choice whether to work for money or not. (Note I said "many". This is not an absolute.) I'm quite frustrated at the moment with my daughter, who is brilliant with a 6-figure income in the healthcare business at 25 years old, and keeps putting off grad school like she doesn't have a care in the world. "Why should I commit that kind of time now if I'm not sure I even want to be working the rest of my life?" The converse of course is that most women find themselves in the position of having to work to support themselves and their families financially. Those women are likely to excel--Barbie or not. This sounds like framing to me. Career Barbie may seem abstractly career-focussed, but it exists within the frame of Barbie, which is vapid, subservient, vain etc. So, any Barbie triggers the frame of Barbie. I have only my personal experience to go by. I had a son, not a daughter but I did play with Barbie myself. I am inclined to agree with Ruben about the framing. I didn't have Career Barbie, as mine were seventies hippie like barbies. I had Barbie's friend Yellowstone Kelly, a redhead with a tan who liked outdoor pursuits and came with her own plastic tent. For me, the influence of Barbie was entirely about how I saw my own body. I believed that when I developed the body of a young adult woman I would look like Barbie. What a shock when that didn't happen. And because it didn't happen I thought of myself as somehow defective. What Barbie taught me, though subliminally, is that you can do anything but you should look hot while you do it. "And guess who performed better on a math test, coeds who took it after being asked to try on a bathing suit or those who had been asked to try on a sweater?" That's an incredibly old fashioned word. It implies that students are male by default. Women and girls are the exception, thus, co-ed. (And yes I know that there were a few exceptions where girl schools were changed to be co-educational and then the boys were called coeds). I'm surprised that anyone would use that word in a non-ironic way. As a girl in college planning on being a doctor, I played with barbies my whole life. I was obsessed, and had fashionista babies galore with horses and houses and cars, the whole shebang. I took 7 AP courses in high school. Barbie has never affected me being a level headed women writhe big goals for life. This seemed to me like a feminist trying to assert her point of view through questionable ( in my opinion) studies. My instinct is that this is not direct cause and effect. That is, the two commercials did not cause the students to do poorly in math and the short play with Barbie didn't cause the girls to assume they had fewer career options. Rather, the commercials and dolls were symbols that reminded the girls and young women of cultural messages they'd already assimilated. The commercials and images are filed in a place with all of the "women's roles" information in the mind and prime people to think in certain ways. Ideas about what women can do are shaped by wider influences. I would have been surprised if playing with the dolls would have had any effect whatsoever. And the results in my opinion confirm that it did not: no matter which doll the girls played with, for only a few minutes, their ideas were unaffected. If the girls had not played with the dolls, they would have probably given the same answers. So the conclusion is: playing with dolls for a couple of minutes does not affect girls' opinions on their gender's capabilities. The conclusion is not: playing with dolls for a couple of minutes had the effect of producing stereotype ideas. Experiments (especially poorly designed ones) are in my opinion the wrong tool to try and measure these things. And the bikini experiment is just ludicrous, and I feel it is sexist: the idea that female bodies and intelligence are opposed things lies at its core. I think that it is very likely that the real cause of the dispairity is Stereotype Threat. Stereotype threat is the phenomenon whereby individuals who are in a stereotype-threatening environment perform in line with their stereotypes due to self-perception. In one study, African-American and white male atheletes were given a pen-and-paper atheletics test. When one group was told that it was a test of natural athletic ability, the African-American males performed better. When told that it was a test of stratigic ability, the white males performed better. This difference was significant and stereotype threat has been reproduced in other studies. It turns out, for example, that when women are told that they will perform as well as males on a math exam... they do! Girls playing with barbie dolls are probably primed to exhibit their stereotyped role. The effect can be reversed so easily... all it takes is the belief that the role does not require the performance. I think this is very hopeful.